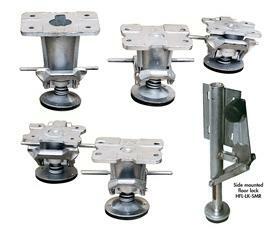 Nationwide Industrial Supply offers a broad selection of U-Boat Platform Trucks, Quantity Discounts available. Government and Education PO's Welcome. CALL 1-800-757-1064. 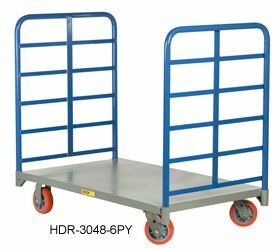 U-Boat platform trucks are perfect for stocking or picking stock on aisles that are narrow or too tight of a fit for a standard width platform truck. Only 16 in. wide. Truck has a capacity of 1800 Lbs. Center wheels are 8" x 2" and made of polyurethane. End wheels are 4" x 1 1/4" and constructed of durable rubber. FOB shipping. Designed for efficiency and ergonomics. Deck is Duramold structural foam, diamond plate design. Structural steel undercarriage. Push-pull ergonomic handle. Ergonomic height work surface with convenient tool storage. Write-on placard for easy load identification. 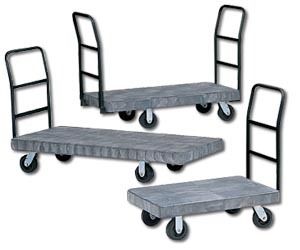 Rolls smoothly, quietly on heavy duty non-marking casters -- center wheel allows cart to pivot on axis. Highly visible, epoxy-coated yellow uprights. H9T52 features cardboard management system that collects excess cartons. Black in color. 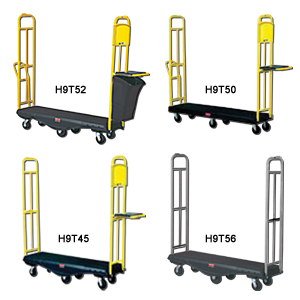 FOB Shipping Point.<br> <b>H9T45</b> Hinged Deck (allows cart to become shorter in length) <b>H9T50</b> Standard Deck <b>H9t52</b> Standard Deck w/Cardboard Mgt. System <b>H9T56</b> Utility Deck (light duty). Tough, durable plastic deck won't rust, crack or fade. Rounded bottom edges and enclosed handles minimize the potential of damage to equipment, fuxtures, and walls. Textured, non-slip surface reduces movement of items/materials. 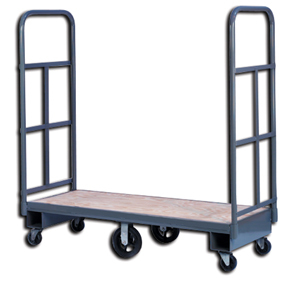 Non-marking wheels provide smooth, quiet operation. Removable handles and shelves reduce storage space. Easy-to-clean plastic deck reduces maintenance costs such as painting, welding, etc. Cart is available in Gray only. FOB Shipping Point. 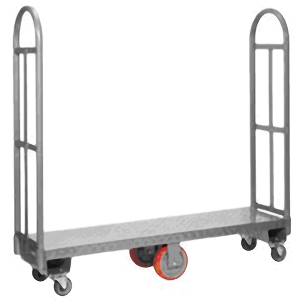 Centered, 8" wheels and casters at each corner allow cart to turn within its own diagonal space. Available in plywood deck with steel frame or all steel deck. Durable 1500 lb. capacity. FOB Shipping Point. All-welded steel construction for 3600 lb. 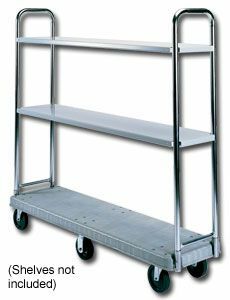 capacity use.&nbsp;End racks extend 36" above deck.&nbsp;Features 12 ga. reinforced steel deck -- 9" deck height.&nbsp;Rolls quietly on 2 swivel, 2 rigid casters with non-marking 6" x 2" urethane wheels.&nbsp;FOB Shipping Point. Uniform locking keeps the unit working properly as spring and pads wear&nbsp;over time. Features a bright zinc plated finish with heavy-duty cast steel construction. Bottom pad includes suction cups for extra grip. 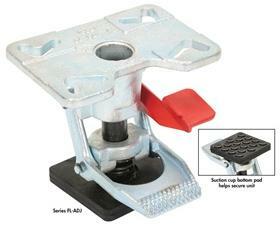 Height is adjustable by turning the bottom pad. FOB Shipping Point. 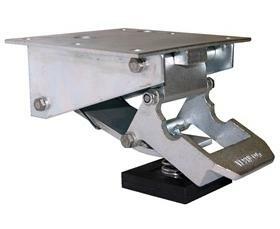 The lowest profile floor lock available on the market today. 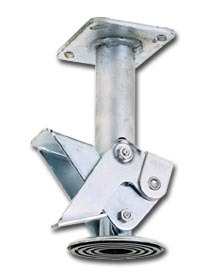 Extended height 4-9/16, retracted height 3-7/8". Features adjustable height pad for precision and wearability. Simply bolt to bottom of cart. Foot operated. FOB Shipping Point.